The other day I had the amazing honor of being nominated with the Blog of the Year 2012 Award by Wanton Creation. Honestly, this feels so special to me as I have only started blogging this year, so to receive an award from a peer (and one I think quite highly of at that!) – especially when you all have so many other amazing writers and bloggers out there to choose from – means more to me than I can express at the moment! 3. 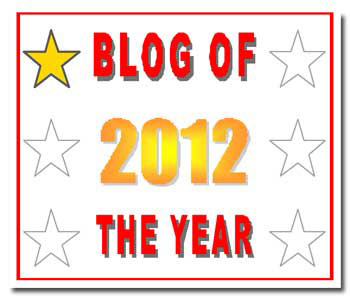 Please include a link back to this page ‘Blog of the Year 2012’ Award and include these ‘rules’ in your post (please don’t alter the rules or the badges!) – I’m afraid I have no idea where this award originated so I can’t link back to the page it’s asking me to. As you can see in the badge I posted above, I have one star! Yay! I really like the fact that you can receive this award more than once because I am WOEFULLY behind on reading blogs right now, so I have no idea who on my list has already been nominated. Also, I know it says to write a little something about each blog, but I feel like this post is already long enough, so I think I’m going to let the nominations speak for themselves. Each blog/blogger I’ve chosen has inspired me, made me think, made me laugh, and made me cry at some point over the course of this year. But most of all they have embodied the true spirit of friendship and community that makes blogging the positive and wonderful experience that it is. I would also just like to add that there were so many more that I wanted to choose, but my list was getting kind of long so I decided to stop at 10. I might just do a second round up of some of my other favorite blogs from this year in a day or two, however! Thank you, thank you, thank you, from the bottom of my heart, to all of you who have been such faithful and lovely readers over the past few months. If it weren’t for the support and encouragement of you all, I’m sure I would have given this thing up long ago. The fact that you keep coming back for more – and even nominate me for awards! – when I’m busy being my harshest critic is truly heartwarming and inspiring. I love you all!! Congratulations and thank you so much for the nomination (although I am a bit of a shocker at accepting awards). I love your blog! Congratulations! In 2013, I wish the best of luck in all your endeavors! Continue to shine bright!